Everyone has goals. My top-priority right now is to buy the entire Princess Set of furniture at Gracie Grace. This is going to involve a lot of fishing and fruit picking, but I think I …. I mean my little pink character… deserves this Marie Antoinette inspired bedroom set. My love for the movie Kissing Jessica Stein is well known. I think Jennifer Westfeldt is a great comic actress. I truly love the neurosis of all her characters, not to mention that she has fabulous hair. It’s been recently brought to my attention that she’s the longtime girlfriend of actor Jon Hamm, or as you might know him, Don Draper on Mad Men. I’d hate her, but I just can’t. One of Westfeldt’s co-stars in KJS is Scott Cohen. You may remember him as Max Medina, Lorelai’s ex-fiance on Gilmore Girls. Cohen also starred in a little made for TV mini-series called The Tenth Kingdom. He played the big bad wolf and I kind of had the hots for him in this role. Well look who moved into Gherkins last week?! A creepy wolf! I hope he doesn’t eat any of the villagers. On second thought, maybe he could eat Victoria with a side of Opal. They’re both pretty annoying. It’s definitely looking a lot like Christmas in our apartment right now, but I’ve also been decking the halls a bit in my house on Animal Crossing too. 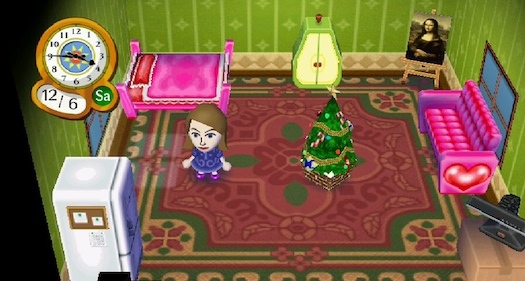 How cute is the little tree that I bought at Tom Nook’s store!? I hope they’ll have more decorations available soon. I keep waiting for it to dawn on me that picking peaches, fishing, and delivering packages to the other quirky game characters is going to get old, but it just doesn’t. It’s actually extremely addictive. Did I mention that “Gherkins” is the name of my town? Today I picked every peach in the village so I could pay off my mortgage. I’m a little bummed though since my favorite curmudgeonly town resident, Butch, decided he was going to move out. I probably should hate him since he sent me on a three day wild goose chase in search of a Char fish that never materialized, but honestly I’ll miss him and his matronly green striped outfits. Hopefully someone cool moves into the vacant house. According to the weather report it’s supposed to snow a little in Boston tonight. Video games must be imitating life now as it’s been snowing in Gherkins all day. Really this post was all just an excuse to show off my new purple outfit and matching violet shoes. 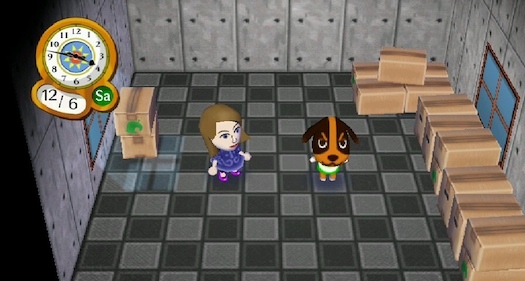 I’m really terrible and I never play our Wii anymore, but I’m totally obsessed with buying the Animal Crossing: City Folk game when it comes out on Sunday. It looks completely adorable! Wandering about an imaginary world that serves lattes and has Judy Jetson like hair salons is right up my alley. 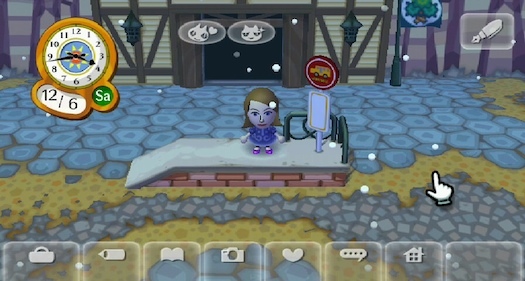 Apparently, with the help of yet another Wii add-on you’ll also be able to play live with friends. Will any of you also be indulging in this charming video game? Let me know if you want to exchange Wii numbers.